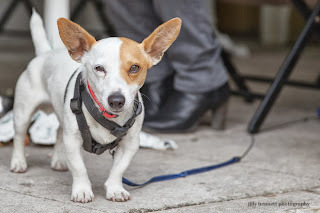 This adorable Jack Russell Terrier was at the next table to me at the fabulous Beausejour Restaurant in Gorbio. In the last photo, you can see how he managed to wind himself around the table leg when I wanted to take his photo, but he was soon untangled. He's called Eliot and he's 3 years old and lives in Nice. Nice to meet you Eliot! 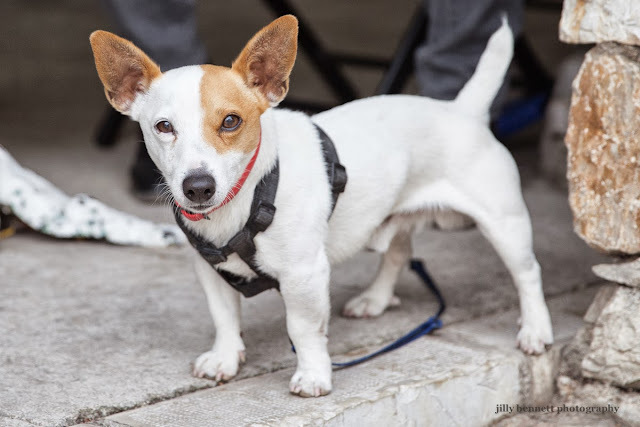 We had a rough coated Jack Russell when we were first married. He was abandoned in London! A real character, loved everybody and got on really well with our other rescued dog Tess. She came from Battersea dogs home and would wee herself whenever we got up from a chair. We eventually cured her with love and affection. We had them both for about 16 years! My goodness he really is wound around there! So cute! so cute. and i love the patch on the eye to.